The lecture will take place at 2:30 p.m. in room 252 of the MacOdrum Library followed by a reception at 4:00 p.m. In 2011 a visitor walked into the Montreal Museum of Fine Arts and stole a 2500-year-old relief of a guard’s head valued at over $1.2 mil. In July of 2018, the New York Supreme court ordered that the sculpture, which had been seized by the District Attorney of New York from a London-based antiquities dealer, be returned to Iran. 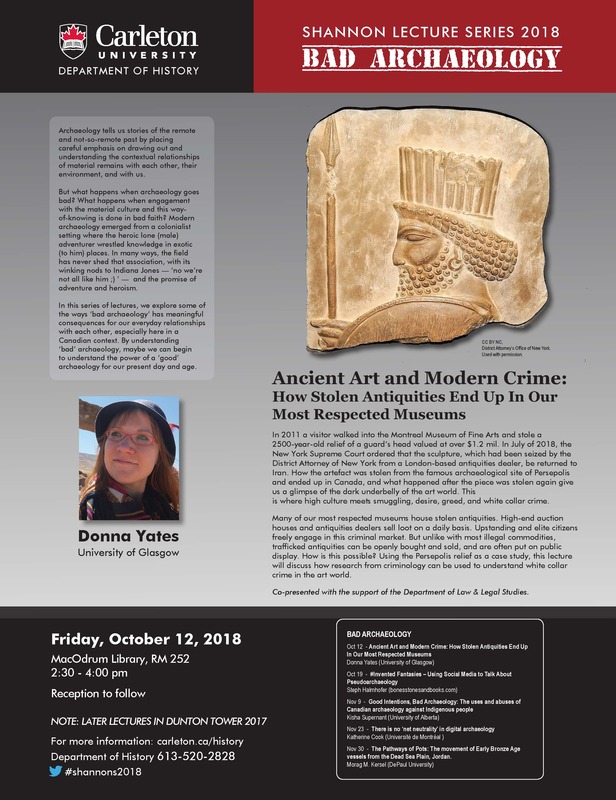 How the artefact was stolen from the famous archaeological site of Persepolis and ended up in Canada, and what happened after the piece was stolen again give us a glimpse of the dark underbelly of the art world. This is where high culture meets smuggling, desire, greed, and white collar crime. Many of our most respected museums house stolen antiquities. High-end auction houses and antiquities dealers sell loot on a daily basis. Upstanding and elite citizens freely engage in this criminal market. But unlike with most illegal commodities, trafficked antiquities can be openly bought and sold, and are often put on public display. How is this possible? Using the Persepolis relief as a case study, this lecture will discuss how research from criminology can be used to understand white collar crime in the art world.